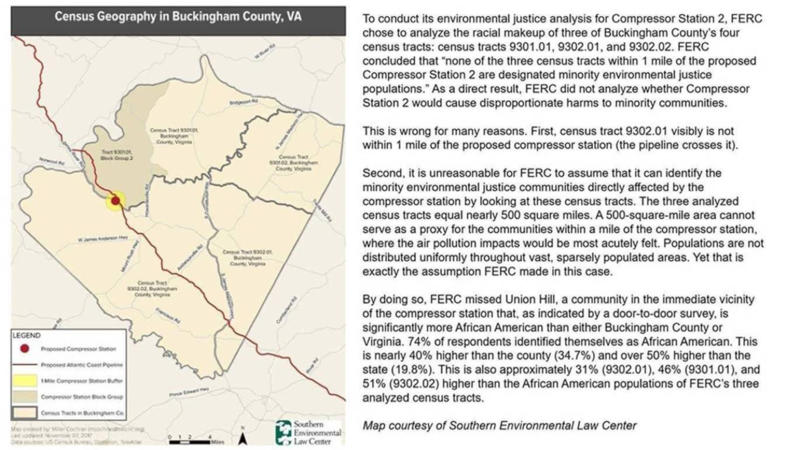 Additionally, FERC lumped all “minorities” together, such that unique minority communities who represent proportionately small percentages of the overall population were ignored. A staggering 25 percent of North Carolina’s American Indians live along the ACP route. But because the American Indians in North Carolina proportionately constitute a small population (approximately 50,000 people) in the state, FERC offered no analysis of the effects of the ACP on American Indians. Tribal governments and scientists informed FERC that American Indian populations were being masked by FERC’s methodology, but the agency did nothing.